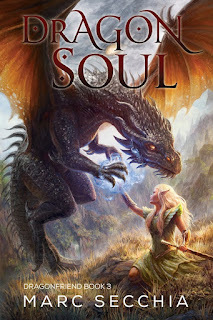 I'm pleased to announce the release today of Dragonsoul, the third volume in my bestselling Dragonfriend series, on Kindle and Kindle Unlimited. Stricken. Dying. Laid low by the accursed Dragon Haters, Hualiama must confront the greatest powers of the age as Dramagon’s disciples encircle the ultimate prize–her. A girl born of fire, raised by Dragons and imbued with the terrible, corrupting power of ruzal. Now, portents fill the sky. Legendary armies fly to war. The prophesied comet crashes into the Island-World, bearing the spirit of a malevolent Ancient Dragoness, Numistar Winterborn. She will obliterate any that seek to thwart her ambitions–all the armies of Men and Dragons, the monstrous war-machine of Shinzen, Warlord of the Giants, and most especially, Hualiama and Grandion, the Tourmaline Dragon. Epic powers collide in the worlds above and below the clouds. Can Hualiama forge a path, a new way, as the first Shapeshifter Dragoness? Can her forbidden love for Grandion flower amidst the smoke and ruin of war? Yet she dances over Islands, forging a fate inimical to all evil. For this she was born. First of her kind. Heart of flame. Shapeshifter Dragon. Dragonsoul. Purchase: Grab your next awesome Dragonride here! Series note: Dragonsoul is the third book in the Dragonfriend series. The fourth book, Dragonstar is planned for release in early 2017. Dragonfriend is an epic fantasy series for Young Adult and older readers, set in the same world as Aranya and The Pygmy Dragon. Mighty dragons and unforgettable adventure await in a unique world above the clouds! You made my day! Can't wait to read Dragonsoul! Hope you enjoy it very much! OMG!!!! I'm so excited!!! I can't wait to get started reading it, I've been waiting anxiously for this book! How did you go with this one, Megami :-) ? Hardly wait until till the next 2 releases next year. Also will Pip be getting another book by chance? Thank you so much, Nikki! Well, you don't need to wait for next year for Song of the Storm Dragon. They're whirling into the concluding battle as we speak, on my computer. On course for late Oct release. :-) I'm excited about this one as well! Now, the mere fact that I don't want to spoil in a public place should tell you something about your question ... so don't make me answer, alright? :-) Hope you're having a great week. Thank you so much :-) A touch of Pygmy mischief and a soupçon of majestic Immadia coming your way! Hope you enjoy them! I purchased and read the first three through amazon. I thought it was a trilogy so I'm both anoyed and happy. And I'm happy that the adenture is not over yet and I can enjoy another installment of this story. Well they were originally planned as a trilogy but I ended up with far too much material to squish it comfortably into a three-part series. But I'm going to do my utmost to bring it in with 4 books - same with Aranya. Not sure at all of dates for this year, but the 4th will be called 'Dragonstar'. I'm waiting with as much patience as I can muster for Dragonstar your cliffhanger ending has me checking weekly for possible clues as to when in "early 2017" the release might be. Honestly though I'm enjoying the books and don't feel bad about a fourth or even fifth book. They are worth the wait, price, and time given to read. I look forward to exploring some of your other books now too. Cool, thanks :-). The pace and content level of The Horse Dreamer is quite similar to the dragon books as well. The next out will be The Girl who Loved the Whales, Islesong #2. That's in editing at the minute. I've been reluctant to put absolute dates on delivery as I've been finding that stressful and it puts pressure on family life as well. Trying to balance everything! I'd rather you take your time stressed writing is viable in people's writing, you start seeing story elements rushed that could have been more elaborate and full. I'm not saying I have seen that in your work just speaking in general terms. Any update on Dragonstar's release date? Hi Cindy, thanks for writing. It's too early for me to set an exact date but I'm about 58K words into the tale. I'm still aiming for late June or early July, but as I get further down the track I'll announce a preoder date and a publication date here :-). Ohhhh boy cant wait for it. Nothing better to do on a ship out here at sea than read about dragons done actually right and then pick up a book done by the same author and read about A girl singing with whales. Chilling because you can actually hear whales singing through the metal hull down in the bilge. DragonStar's got me jumping up and down to hear its being worked on. Keep it up! Yeah, I'm still waiting and checking for updates regularly I'm thinking about rereading the first three to get ready for its release. Yes Aug 16th !!! Acording to Amazon pre order. The Horse Dreamer goes BookViral!